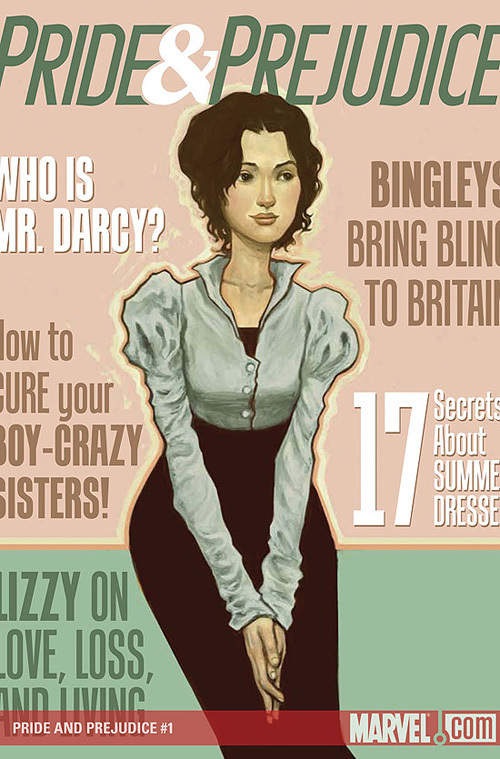 Released last year on – I kid you not – April first, I had NO IDEA someone had converted Pride & Prejudice to a rather sumptuously illustrated five part comic. And by someone, I mean MARVEL! Mein gott! Though it appears only issue one’s cover is developed as a flashy women’s magazine, the rest of the editions look delicious. Lords I hope Pulp Fiction have them in stock. Not that I can afford them but that’s clearly beside the point! Its Pride & Prejudice for crying out loud! A girl can’t ever have too many adaptations. Just because I already have a number bordering on a dozen in quantity, definitely does not exclude the possibility of getting my delighted fingers on these. I’m sure post posting this the delectable mythosidhe will inform me that she posted about this a year ago, or the gorgeous librarian type deasilvae will berate me for forgetting she told me about it forever ago. xD BUT! Better late acknowledging awesome than never? Plus I… Can’t think of a decent excuse. Chewbacca? ETA: By all accounts, it appears that the interior of the comics don’t match up to the expectation of the covers. This is the hour of my discontent!